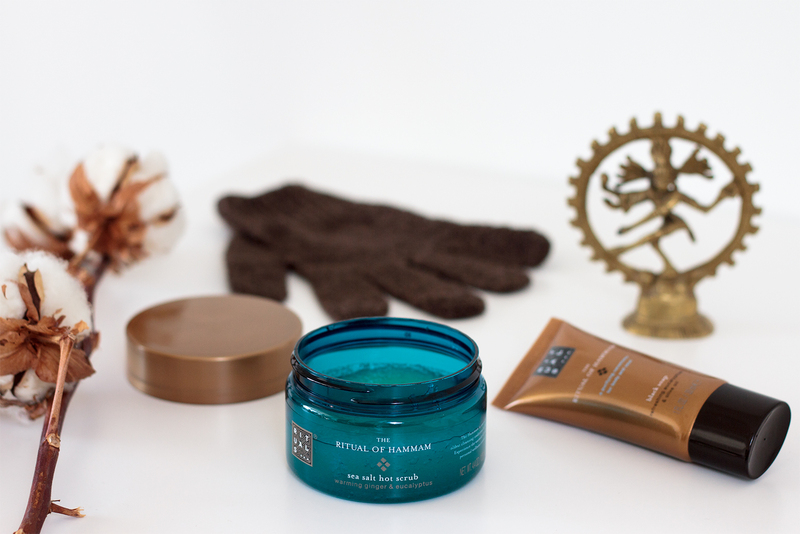 My love affair with Rituals is no secret at this point. 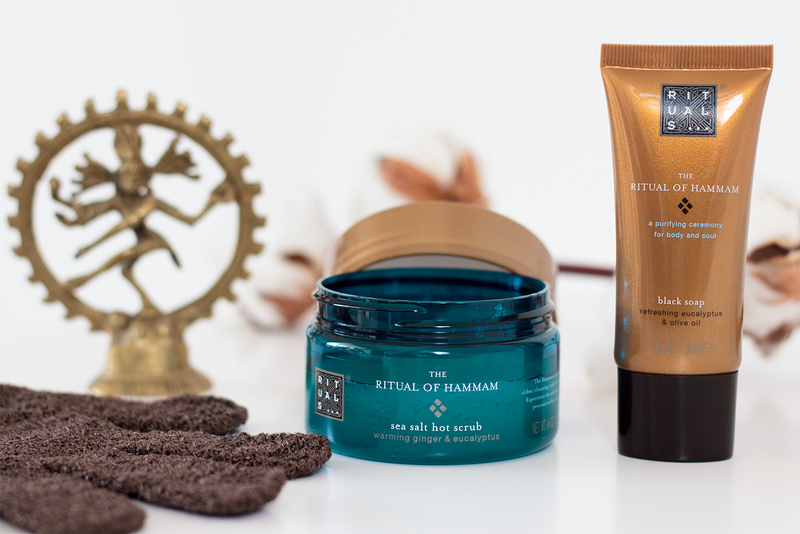 To celebrate the renewed collection The Ritual of Hammam, on my last purchase Rituals offered me this beautiful trio composed with a sea salt hot scrub, a scrubbing glove, and a black soap. Don't you just love it when you receive unexpected gifts from your favorite brands? I couldn't wait to try these and have myself a relaxing spa treatment at home! I'm sure that we've had the fragrance sticks from this collection before and, if I'm not mistaken, the bath bubbles too. Both chosen by David. Personally, I find the fragrance to be more on the masculine side because it is fresh and earthy at the same time. I love it nonetheless. There's something about men's fragrances that just brings me comfort. The hot scrub is made with sea salt for a purifying effect, warming ginger that will evolve you in an invisible blanket of coziness and eucalyptus for the refreshing touch. You can use this scrub together with the black soap as a finishing touch, or on its own. I personally find this to be a great product for those downer days. You know when you're feeling down, on your first day of the period (for the ladies) or with a cold? This is great to boost up your mood on those days and bring you back to life with a smile on your face! 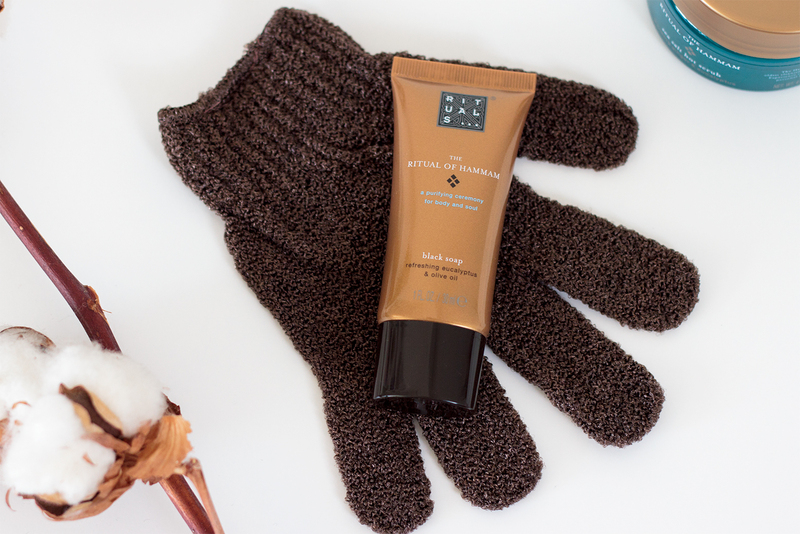 I am familiarized with these kind of scrubbing gloves from back when I used to work at The Body Shop, but it was the first time I have ever seen them at Rituals. I find them especially good to use with your regular shower gel, once or twice a week to give that nice weekly exfoliation. These are great to exfoliate your legs prior to shaving as it activates the circulation, gets rid of the dead skin cells for a smoother shave and also helps to prevent ingrowth hairs. Very practical to keep in the shower too! The black soap is composed of organic eucalyptus and olive oil for a refreshing and nourishing touch. 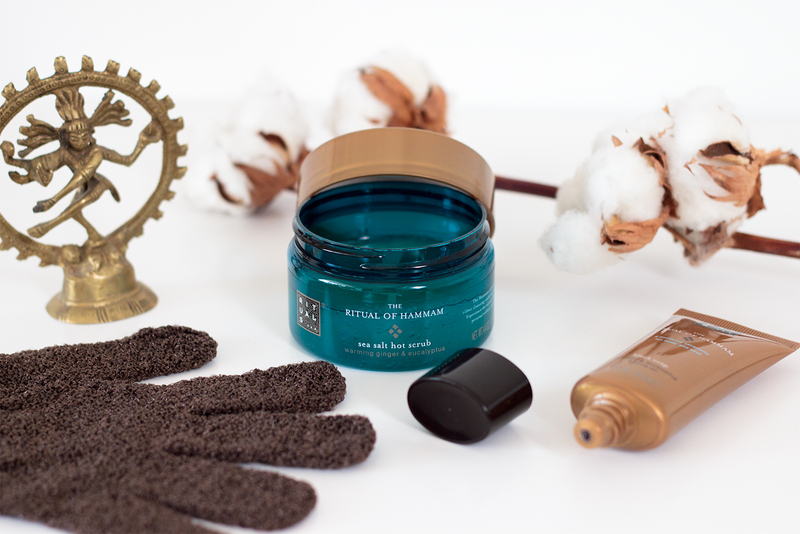 It is great to use as a massage treatment prior to an exfoliation. After a hot shower spread the black soap all over your body and massage it for a few seconds in circular motions to activate the blood flow. Leave it for five to ten minutes for it to do its magic of dissolving the dead skin cells and leave your skin deeply cleanse and soft. Before rinsing it off, you can use the scrubbing glove or the sea salt hot scrub. 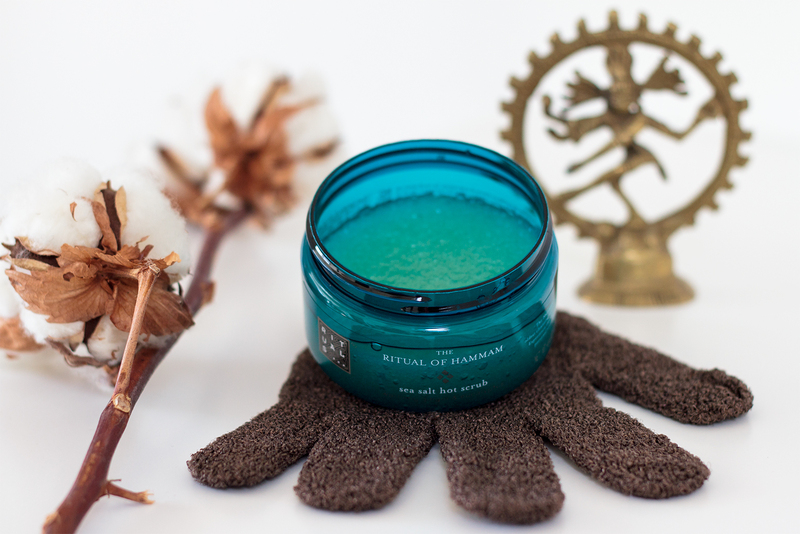 After this treatment, your skin will feel soft and your soul purified. 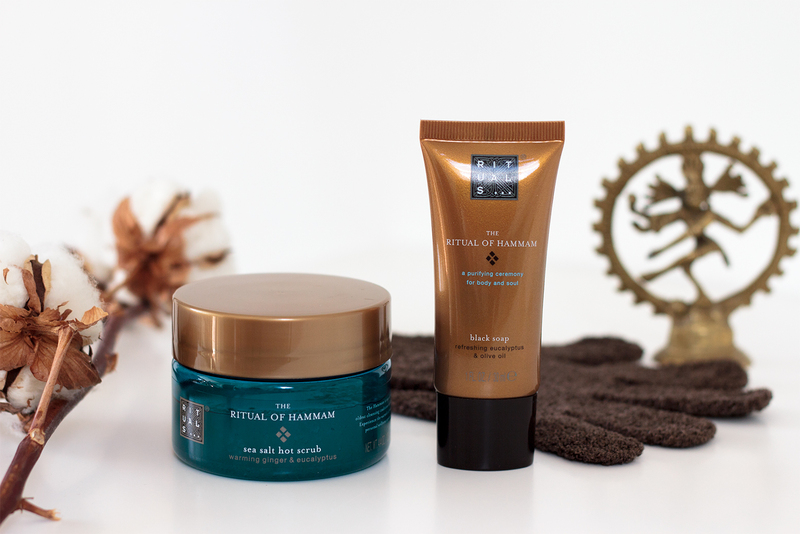 Don't forget to moisturize well your skin after an exfoliation with an oil or a rich body cream. writing. I've had difficulty clearing my thoughts in getting my ideas out. the first 10 to 15 minutes tend to be lost just trying to figure out how to begin. Any recommendations or tips? Oh wow thank you so much!!! That's actually a great question and something I've struggled with for a while in these past months I was away. Not so much in putting my ideas out but more so if it was at all worth the effort, but that's something I'll mention that in a future post. Actually, you know what? I'd love to create a post talking all about this question of yours, and it would be lovely to be able to credit you if you'd like to tell me your name :) But for now, the best tip I think I can give you is to use and abuse the drafts. I have so many drafts you wouldn't believe it. Some of them come to life whereas others go straight to the bin months later. Don't be afraid to express yourself freely, that's what keeps it interesting I guess! I hope it helps you somehow! hahah that’s such a great reward! I hope the meal was delicious! I'm sorry, I had to take a few days off since I got sick, but I'll be back on track soon! Let's keep in touch! Thanks a lot for the feedback! It's lovely to have you here! Great weblog here! Also your website loads up fast! What web host are you the usage of? Oh thanks a lot! Truly! Hey! 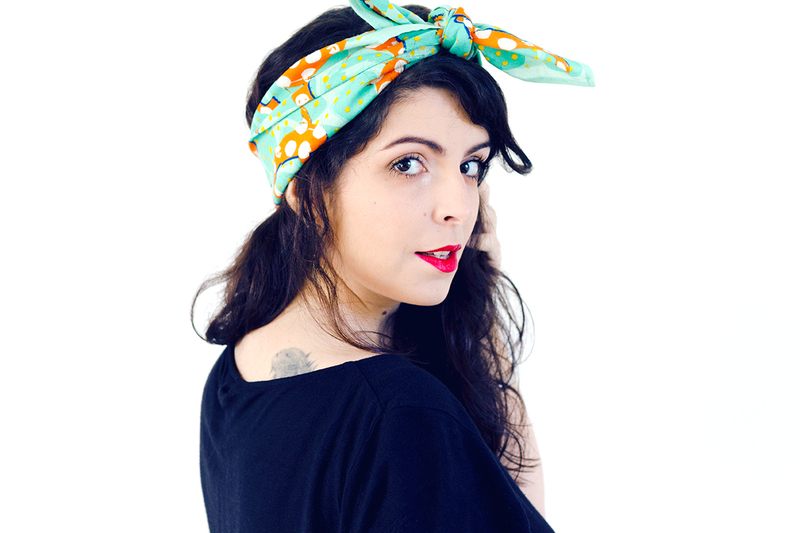 I'm Inês, a Portuguese living in The Netherlands. Here you'll find me rambling about my personal experiences, beauty faves, delicious recipes, places worth visiting amongst a bunch of other stuff. Hope you enjoy and stick around!